I belong to Kadapa district. Movies fascinated me right from childhood. After finishing my post graduation I wanted to join as assistant director. But my parents refused and insisted that I join any other line of work except cinema. I was sent to Chennai to manage our family business. I often visited my classmate Vijaya Bhaskar Reddy who produced Telugu films. But I disliked the filmy atmosphere. Though I liked films, I somehow developed a dislike for film people. Probably one of the main reasons why I took so long to join the film industry. I shifted to Hyderabad and started looking for business opportunities . My neighbour in Chikkadpally was working in Annapurna Timber Depot. He introduced me to Chalasani Ramesh who was looking for a dynamic person. He recruited me into Annapurna Litho Graphics that takes care of poster printing. Nagarjuna was impressed with my work. This was the time when the shooting of Vikram was just complete. He was looking for a PA and appointed me. I had my office in a small chamber in Nagarjuna's house. But soon I realised that I did not have much work. With the help of Yarlagadda Surendra I shifted again to Litho Graphics department. I started my career as cashier and went on to become the assistant manager for that department. They wanted a trustworthy person to handle financial transcations for Yarlagadda Surendra's film Rao Gari Illu. I told him frankly that given the straightforward person I was, there could be a problem for others. He told me that I could return to Litho Graphics if I found the job difficult because of my honsety. But soon I adjusted well and established a good rapport with Nagarjuna, Venkat Akkineni and Yarlagadda Surendra. Those days most film activities were controlled from Madras with Hyderabad only for shooting. I was sent to the Annapurna office in Madras. It was a turning point in my life. I was the chief production executive for the film Shiva. Nagarjuna was very impressed with the way I handled production. Then I was transferred to Hyderabad as administrative manager in Annapurna studios. I was looking after studio administration and production of films under the Annapurna banner. I was the executive producer of Ninna Pelladatha. My association with Nagarjuna and Annapurna group started with Vikram and ended with Ninne Pelladatha. As I had directorial ambitions, I watched many leading directors from close quarters. I never worked as an assistant director. I narrated the script of Nidhi and Srikanth immediately accepted it. I am grateful to two persons in the entire film industry. They are the Annapurna group (all family members of Akkineni) and Srikanth. Srikanth accepted my script when he was at the peak of his career (Pelli Sandadi) even after knowing that I did not have any experience in direction. 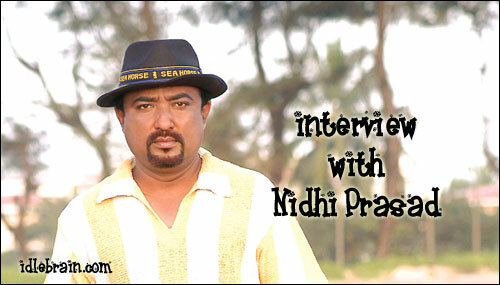 The best script I have written was Nidhi. Producer Prafulla (from Bombay) is a good human being.. He was doing Bhai (Hindi remake of Telugu film Anna) in Hindi. Due to some compulsions, he had to concentrate on the Hindi film and could not divert funds for Nidhi . We could not make even 25% of what we scripted due to financial problems. That film did reasonably well in B and C centres but failed in the A centres.After the film released Nagarjuna called me and offered me the job again. I thanked him for the generosity and politely refused it. For the first time in the history of Telugu film industry we sold the film all over Andhra Pradesh and with the advance given by the distributors, we started the production office. We introduced a new producer N Suryaprakasa Rao with that film. He is the one guy who gave me an advance of 50,000/- in the beginning of my career. My friends advised me to do it on my own as the project was already profitable. But I felt that it was my moral obligation to Suryaprakasa Rao. Asian Sunil and Sudhakar Reddy bought the film for the entire AP terrirority. Unfortunately it did not do well. I could not think clearly and tried doing another love story with Uday Kiran as hero. I take the responsiblity for the failure of Holi. But the music and songs were appreciated. After the failure of Holi, I decided that I should make films that personally appealed to my instinct. An NRI Harsha Reddy, came forward to make a film with me after watching Holi. He was undettred by the failure of Holi and gave me a free hand. I have a grip over action films and comedies. He wanted to do comedy film because making an action film is far more expensive.That is how Andaru Dongale Dorikithe was made. It was a successful film. After ADD, I got many offers. I was doing a script each for Ramoji Film City and Nitin. My friend Raju (of RPG productions) suggested the remake of Malamal Weekly. Raju is my friend with good experience in production. I was involved in the production aspects of all the films I directed. It was my first offer where I didn't have to be involved with production. I took one week to make a decision. Malamal weekly is more realistic and is a well made film. The concept is good.. I suggested changes which would increase the budget. But Raju got convinced. We doubled the casting in Telugu. In Hindi there are 10 main actors. In Telugu we took 20 comedians. I inserted five songs in the film without disturbing the mood and pace of the script. The original had only one song. I wanted to have a dialogue writer with a terrific grip in Telugu. LB Sriram - a prolific dialogue writer who later turned into a busy comedian agreed to to pen the dialogues. The other comedians include Brahmanandam, Kovai Sarala, MS Narayana, Krishna Bhagawan, Mallikharjuna Rao, Abhinaya Sri, Bhuvaneswari, Kondavalasa, Ram Jagan and Kadambari Kiran. Songs play a very important role in the commercial success of any film. The majority of people who watch Telugu film in theatres comprise of illiterate people from below poverty line. I feel that we should target them while making films. I inspired Chakri to come up with good music. We are very happy with the songs. I would like to give special thanks to Chakri. He has given outstanding quality in a limited budget. We aimed for a budget between 2.1 crore to 2.2 crores. It is touching 2.5 now. The budget of the film has exceeded by 10%. The talk of the industry is that how I was able to complete the talkie part in 30 days especially with so many busy artistes working in combination scenes. I always had very good relationships with all actors and I was able to convince them to adjust dates to mutual convenience and work in tandem. Raju and Praveen worked in perfect co-ordination in the production and never interefered with the direction. You can call me an Ekalavya Shishya of director Priyadarshan. I went to Chennai to meet him when I decided to direct films. I asked him for his suggestions. He asked me to listen to everybody and consider their suggestions during the scripting. But advised me against listening to anybody once the shooting commenced.That made sense and I followed his advice. Making the remake of a film by Priyadarshan has been an unforgettable experience. I heard that BLBD satellite rights were sold for 61 lakhs. Is it true? Yes. The E TV guys had confidence that it would become a blockbuster . That is the reason why they gave the staggering amount of 61 lakhs for satellite rights. This kind of money is offered only to films of big heroes. I would like to thank E TV for encouraging a small film like BLBD by offering a good price. Negotiations are going on. We are going to finalise the deal in a week. Surprsingly I am getting calls from different parts of the world (Europe, Dubai, Australia and USA). I have not decided whether to sell the overseas rights or do it countrywrise. I have asked my team to come up with a report. After going through their suggestions, we will finalise the overseas deal..